How are you prepared for the new ICD-10 conversion? Did you know that STAT!Ref has made the process for the ICD transition much easier, with integrated cross-reference conversion tools? Popular with STAT!Ref subscribers and new STAT!Ref client partners, STAT!Ref is the only place to find both the ICD-CM and ICD-PCS Conversion Tools. ICD-9 is being expanded from 17,000 to approximately 141,000 ICD-10 codes, but STAT!Ref shortens the process of checking codes for accuracy with these new convenient cross-referencing tools. Simple and straightforward new panels on the STAT!Ref interface, as shown above, allow users to enter in a ICD-9-CM or ICD-9-PCS code and get a pop-up panel containing the ICD-10-CM or ICD-10-PCS equivalent. Or, simply get the reverse translation functionality at the click of a button. 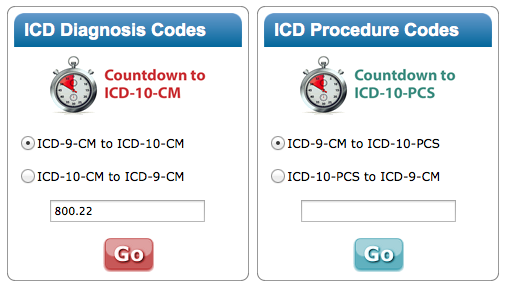 These extremely valuable panels are available FREE to those that purchase both ICD-10-CM and ICD-10-PCS. Click here for an informative handout about all of the STAT!Ref coding resources and tools. Or, please contact a STAT!Ref Team Member today here or at 800-901-5494 to speak about these new features or to schedule a webinar demonstration when it best suits your schedule.